I wanted to put this post off just a little longer in case someone hadn’t seen the Llama Genie Airship advertisement. I thought the Cat Ship was my favorite thing but now it’s the Llama Genie Airship. So here is my “Tiny Things” entry for Monday Artday. It has dovetailed nicely with a recent fascination: hand-drawn sneakers. 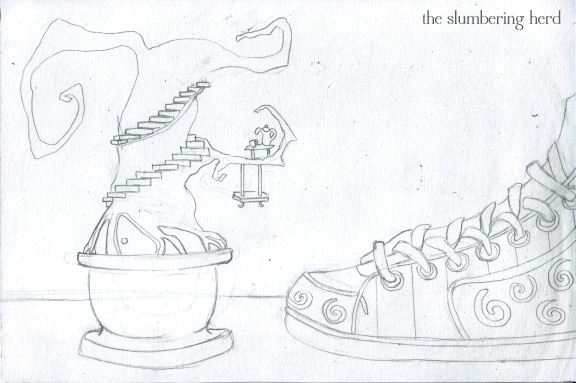 I swear the Illustration Friday topic “Heights” included many entries with sneakers. And I think I commented on neat sneakers in at least 5 of them – red sneakers, black and white sneakers, old-fashioned ones, and others – if I commented on your sneakers let me know and I will add it to this list! 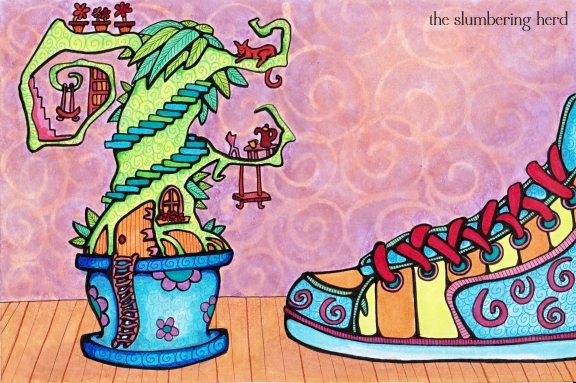 This entry was posted in Copic Markers, Progression Photos, sketches and tagged Copic Markers, fairy house, illustration, liquid frisket, monday artday, sneaker, treehouse on April 26, 2012 by The Beast Tender. what a cute little tiny things world! are you going to make more from this? 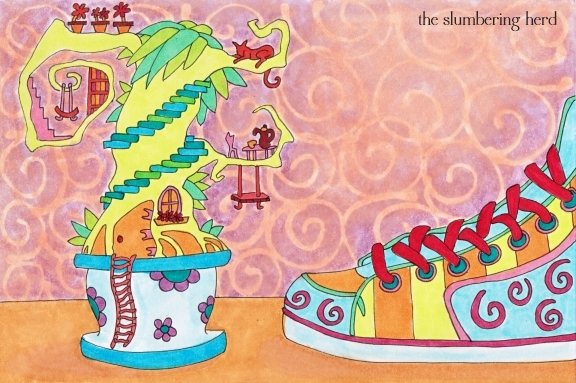 What a fashion-foot-forward sneaker! Well executed! Love the idea you came up with for Tiny Things. I love the tiny details, the stairs and the woodwork. Oh, and the leaves. And colors. Makes me want to live in a potted plant. My internal little girl imagination is piqued with all the tiny details. The shoe pushes my mind to see it even smaller. Nice piece. This is one of my favorites of yours!!! I love all the tiny things in your flower pot treehouse!! And I would soooo wear those shoes!! I love all the little detail. I have always been fascinated by architecture and this is wonderful!!! Good one, Cindy!! Thanks for the clickback, too! Cindy, this composition is so fun to explore. It also works well for IllusFri’s ‘Heights’. The swings invite the pixies to play, as does the tiny cat. (Although she may actually be a lioness guarding the place.) It’s a truly magical world! Keep ’em comin’! Cute, Cindy. 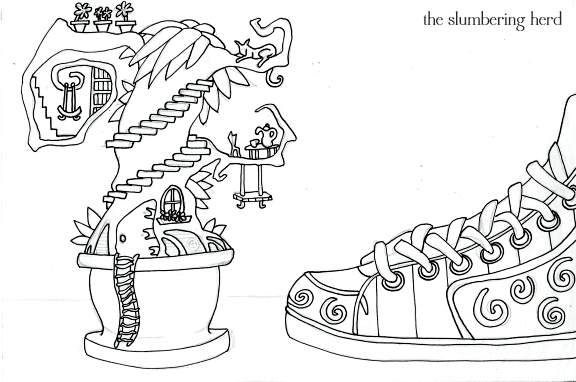 I think you should draw on REAL sneakers…they would be cool! I like the Dr. Seuss inspired tree. Nice details and color, as usual. I love that you post a whole series of images charting your pieces’ development – it’s fascinating, and thrilling, to see them burgeoning into life. Although I share your dismay re. the relative immediacy of computer-generated colour effects, I would tentatively suggest that the resultant image – while also v. cool – doesn’t have the same quality of appeal as your unparalleled Copic marker work. Great stuff, Cindy D! I love tree houses, and seeing a tiny tree house in a tiny plant makes it even more special. Your art has so much whimsy to it. 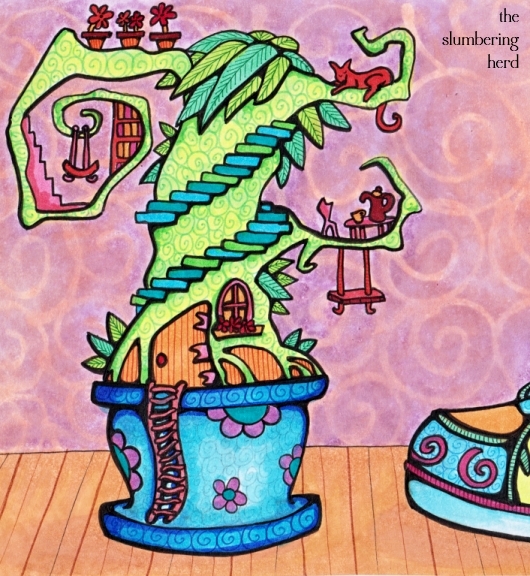 Do tiny flower pot treehouses actually exist or is yours the first, Cindy? This is so intricate and I can imagine a little one staring at this illustration and imagining little fairies playing everywhere on it. Very good! Are you reading my mind?!? 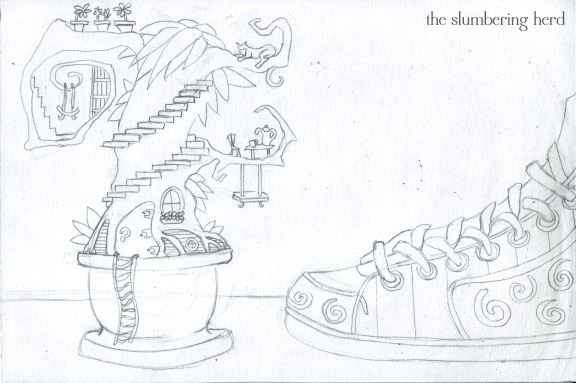 For a while now I have been toying with the notion of creating a bonsai tree-house. This would make a perfect model! Fab shoes too! Very cute. I love all of the little details because I can see something new each time I look at it. Love your work. There’s always so much to look at in the detail and your ideas are amazing. I want those those shoes too – could you go into manufacturing ….? I’m not good with plants, but I would love to have one like this! And a pair of sneakers like that to go with it, nice! I don’t know if you like this but I’ve ‘tagged’ you on my blog. If you want to find out more about it, you can have a look (http://koosjekoene.blogspot.com/2012/04/tagged.html) and see if you feel like doing anything with it. I want sneakers like that!! Mna, I wixh I could tap into your rich imagination. 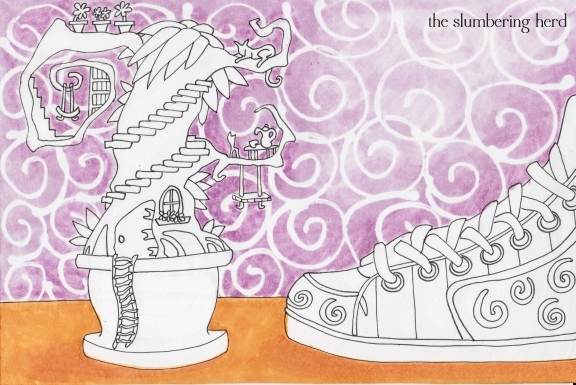 The little steps are so inviting – draws me in – literally and figuratively:-) Well done as always! I just love funky things in tiny pots, and yours is no exception. Super cute!